For the Bank Holiday weekend I joined a group of fellow #BristolBloggers on a day trip to London with Sn-ap Travel. 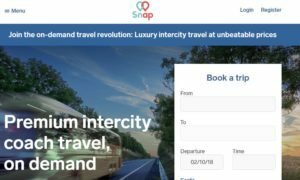 Sn-ap describe their service as on-demand Intercity coach travel. Their tagline on their website is “Join the on-demand travel revolution: Luxury intercity travel at unbeatable prices”. It’s aimed at students, families, solo travellers and groups… anyone who wants coach travel with multiple stops at a lower cost. How do they achieve this lower cost? They don’t maintain a fleet of their own, but outsource the on-the-day travel to local private coach companies that they partner with in the cities they serve. This allows them more flexibility in dates and drop-offs as they have a wider pool of coach company services to choose from. Sn-ap Travel are essentially a coach travel broker matching your travel needs to the right service, but they don’t charge a massive premium for this and are still cheaper than competitors. Win-Win for me. The only downside is that you are sold the travel as luxury. Luxury is subjective and is just a marketing term. To me, luxury means more leg room. To someone else, luxury may mean a toilet and air con. To others it might mean tea/ coffee/ snack service. It is vary variable. The quality of the coach you receive is dependent upon the local coach service Sn-ap have partnered with in your area. My coach for this trip was basic but did have toilet facilities. Would I consider it luxury? No. But others might. For a service that is sold as luxury service, they should define luxury so that each each company that they partner with meets those same specifications. I like consistency in my travel and would refer to know the quality of the coach, and the services on board prior to booking. My travel on the day was perfectly fine and I much preferred the different options for pick-up and drop-off. It allows me to find the pick-up location closest to my home, and one where I don’t need to rely on driving/ parking or using public transport to get to the actual stop. That’s always a bonus. The acid test is whether I’d travel with Sn-ap again. Honestly, yes. I do now find myself searching Sn-ap options first before I travel to London and comparing against other coach companies before I book. Overall Sn-ap gives me the flexibility I want at a price I love. Try it for yourself, with first return visit for free. Visit Sn-ap Travel for details. Disclosure: Return trip from Bristol to London was provided complimentary by Sn-ap Travel in return for honest review. All opinions are my own and remain balanced and honest. Leave a reply on "Intercity travel with Sn-ap Travel #ad #spon"